Looking for a pumpkin pie alternative? I believe I have the answer! Have you ever made a creme brulee? It's really not very difficult to make and it always impresses everyone, even just at the mere mention of it. Add some pumpkin and a vanilla bean, and now you have a sophisticated dessert that is perfect for any special occasion holiday meal. As I was browsing recipes, I noticed that many of them use lots of spices. Yes, of course I love all the warm fall spices that go perfectly with pumpkin, but in this case, I wanted a simpler flavor, one that would not disguise the flavor of the pumpkin. All I wanted was a sweet pumpkin custard, rich and sweet and smooth and velvety. And then I found it! It was on a blog called Love and Olive Oil, and it's AMAZING. It's perfect for a holiday dinner because a total do-ahead. Even if you're not cooking for a special occasion, you should give this one a try! Preheat oven to 300ºF. Bring a pot of water to a gentle boil (this will be used for the water bath later). 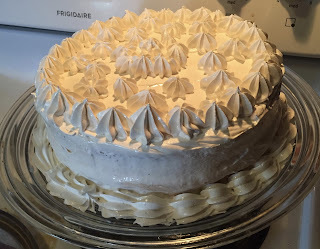 I know the recipe only calls for 1/2 of the vanilla bean, but I used the whole thing. As far as I'm concerned, vanilla falls into the same category as cinnamon: there's no such thing as too much. So I scraped out the insides of the whole vanilla bean, and then placed the empty pod in the cream as I was heating it. Vanilla cream! Then I discarded the pod and added the cream to the recipe as directed. I also added just the tiniest pinch of salt, just to enhance the pumpkin flavor a bit.